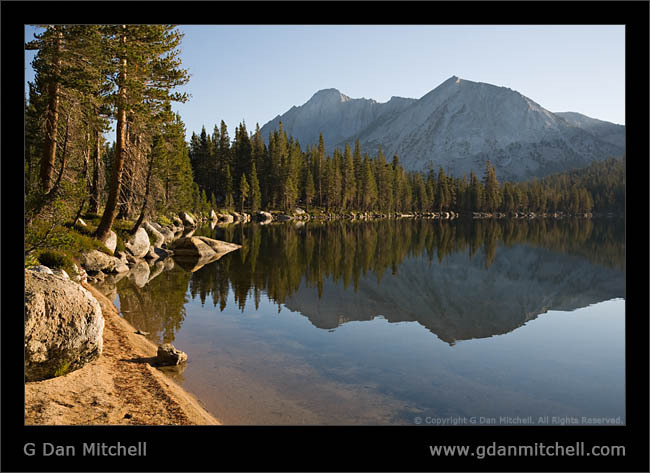 As an example of why it was so hard to get on the trail on the last day of my recent Young Lakes pack trip, this photo of a morning view a short stroll from my campsite. Lower Young Lake, Morning. Yosemite National Park, California. September 11, 2007. © Copyright G Dan Mitchell. Sierra Nevada and Yosemite backcountry aficionados may recognize the taller peak to the left as Mt. Conness.